Thanks to everyone who joined Windham County Humane Society for our 16th Annual Walk for Animals on Saturday, September 29th! With the support of our amazing community, we raised $39,000 to help animals in need. Won’t you help us reach $40,000 with a donation today? There’s still time to donate! 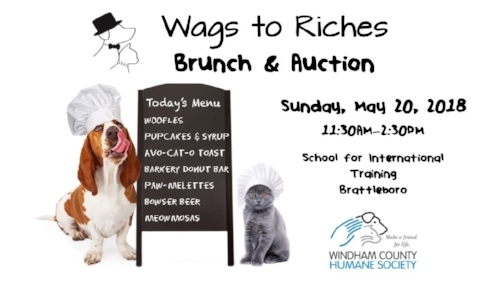 Thanks to our sponsors: One Stop Country Pet Supply, Brattleboro AutoMall, the Brattleboro Reformer, C&S Wholesale Grocers, and New Chapter. This year, Wags to Riches was transformed into a sumptuous Sunday brunch event. Guests sipped on meow-mosas and bid on fabulous items in our live and silent auctions, all while enjoying the amazing view at our host venue, the School for International Training! Live music was provided by Hipfunk Associates. Catering was provided by The Porch. The event was photographed by Kelly Fletcher Photography. View event photos here!